The Managing Director of the Agricultural Development Bank, Dr. John Kofi Mensah has been awarded the Business Growth Achievements award at the 2nd Ghana SMEs and Young CEOs Summit in Accra. 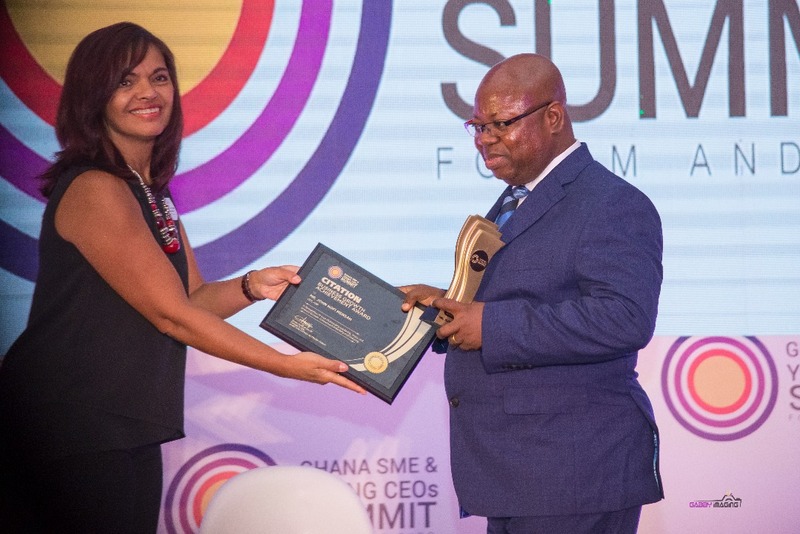 The award was given by the Chief Executives Network Ghana Limited at the 2nd Edition of the Ghana SME & Young CEOs Summit & Expo at the Kempinski Hotel in Accra for his contribution to the growth of the financial sector in the country especially the Agricultural Development Bank. With over Twenty Five years’ experience in Banking he has held senior management positions in many Banks and contributed significantly to the growth of the Banking industry in Ghana. In a brief remark, Dr. Mensah thanked the Chief Executives Network Ghana Limited for the recognition and dedicated the award to all who have helped in his career endeavor. He urged Bankers to exhibit high professional and ethical standards and continue to build trust between banks and their customers. He further proposed for institutionalizing rewards for such standards.